Perhaps one of the least widely understood mechanisms of population change is the role that disease plays. An important part of population dynamics strategy is to increase our understanding of the impact that diseases can have. Work by the BTO in collaboration with colleagues from the Institute of Zoology through the Garden Bird Health initiative has shown just how important these can be (Robinson et al. 2010). 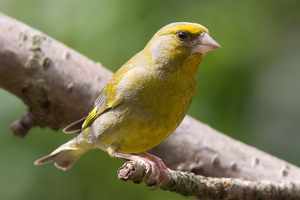 In 2005, we started to receive the first reports of a new disease that seemed to affect particularly Greenfinches but also Chaffinches. Trichomonosis is a common disease in pigeons and doves but seems to have ‘jumped’ species to devastating effect. We combined data from Garden BirdWatch volunteers and the Breeding Bird Survey to show that trichomonosis was responsible for the death of perhaps half a million birds in 2006 alone. Since then BBS has shown that the Greenfinch population has continued to decline even further (see trend). The disease is spread by saliva from infected individuals but maintaining good garden hygiene can help. Robinson, R.A., Lawson, B., et al. 2010. Emerging infectious disease leads to rapid population decline of common British birds. PLoS One 5:e12215 doi:10.1371/journal.pone.0012215. Paper.